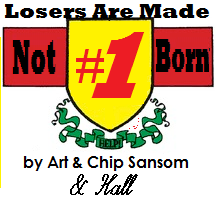 Welcome to the new Losers Are Made, Not Born! While not much is changing, I thought I would combine the four separate volumes of LAMNB into the one so when you combine 1,021 plus 47, plus 8, plus 36, you seem to get 1,112 which is the number of this post. The giant number one on the side is supposed to signify a kind of new focus. Thank you to those who have read and kept reading this despite all of my bipolar idiosyncrasies and I hope you continue reading and tell your friends about this blog. I always thought that this was a decent diner that Brutus ate at all the time. If it's isn't good then why does Brutus eat at it so much? It doesn't even seem like he read the menu. Maybe he just orders beef stew wherever he is. "Welcome to Starbucks. May I take your order?" "Beef stew." "We don't have beef stew, sir." "Beef stew!!"